The .PDF Files are best viewed using Adobe Acrobat. You most likely have it already on your computer. If you don't you can download it free from Adobe. This hand washing lesson kit contains everything you need to teach a classroom full of children how to wash their hands. This kit makes it easy for you to teach kids about handwashing. The teacher/leader script helps you every step of the way. You can follow the script exactly or modify it to fit your students needs. Kids watch the entertaining and educational video to reinforce all the steps of good hand hygiene. They will learn how to wash those pesky germs down the drain. Measure hand washing knowledge by giving a pre and post test. When kids show they know how to wash their hands give them a fun SuperStar Hand Washer sticker, or reward them with a colorful Certificate of Achievement. 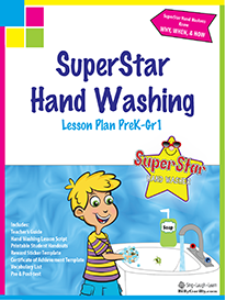 Send the children home with a SuperStar Hand Washer student handout. Print copies for each student, staple together, and send it home for reinforcement of the lessons they've learned. The three minute animated video presents the "Why, When, & How" of hand washing in a way that young children can easily understand, then finishes by having kids rock the house singing the SuperStar Hand Washer song to know the right length of time to wash.
when kids become SuperStar Hand Washers. The SuperStar Hand Washer song is perfectly timed so kids know how long to wash their hands. 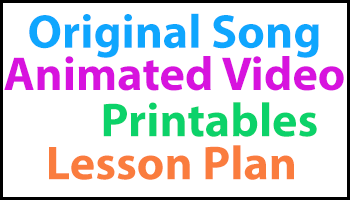 This audio file goes through the song 2 times to help students remember the words.